In 13 years, Bridgette Mayer has built a successful art gallery in Philadelphia's Washington Square. Her clients and artists span the globe. When she first started out as a consultant, she believed she couldn't buy art for herself. "I knew I didn't have the money, or at least I didn't think I had the money," said Mayer in an online video. "But I ended up putting $50 down, and in a few months I paid it off in $50 installments." 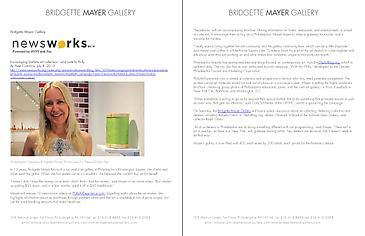 Mayer will release 10 instructional videos on PhillyArtExperience.com, dispelling myths about the art market. She highlights information about art purchases through payment plans and that art is available in lots of price ranges, not just the bank-breaking amounts that make headlines. The website, with an accompanying brochure offering information on hotels, restaurants, and entertainment, is aimed at collectors to encourage them to buy art in Philadelphia. Mayer hopes to make a gateway for tourists, and a resource for insiders. "I really want to bring together the arts community and the gallery community here, which can be a little disparate," said Mayer over coffee in a Rittenhouse Square cafe. "Create a forum for a lot of the art dealers to come togehter and talk about what they are working on and what makes their exhibition unique in that particular month." Philadelphia already has several websites and blogs focused on contemporary art, including TheArtBlog.org, which is updated daily. The city also has its own art-focused tourism campaign, "With Art, Philly," developed by the Greater Philadelphia Tourism and Marketing Corporation. PhillyArtExperience.com is aimed at collectors and prospective collectors who may need some encouragement. The printed campaign materials would not look out of place on a concierge's desk. Mayer is putting the highly produced brochure -- featuring glossy photos of Philadelphia restuarants, parks, and her own art gallery -- in front of eyeballs in New York City, Baltimore, and Washington, D.C.
"When somebody is willing to go so far beyond their typical bottom line to do something that promotes tourism in such an overt way, that gets our attention," said Cara Schneider of the GPTMC, which is sponsoring the campaign. On Saturday, the Bridgette Mayer Gallery will host a public discussion about art collecting, featuring collectors and dealers, including Roberta Fallon of TheArtBlog.org, dealer Christoph Schmidt of the Schmidt Dean Gallery, and collector Ralph Citino. "All of us dealers in Philadelphia are all doing something different with our programming," said Mayer. "There isn't a lot of overlap, as there is in New York, with galleries sharing artists. Yes, dealers are territorial, but it doesn't need to be that way." Mayer's gallery is now filled with 400 small works by 200 artists, each priced for the first-time collector.